Carnival Cruise Line has launched its own canned beer which is now available across the fleet and all private destinations. Carnival has partnered with Brew Hub which is based in Lakeland, Florida to bring its own branded can and kegged beer. The new 16-ounce cans beers are already available on all 26 Carnival ships along with private islands including Half Moon Cay in the Bahamas. 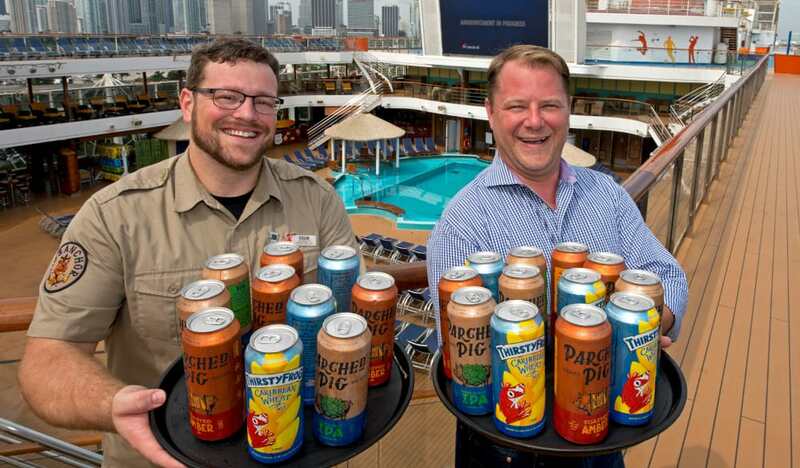 The cruise line is the first in the industry to can and keg its own beer and it followers the hugely popular brewery at sea featured on Carnival Vista, Carnival Horizon and the upcoming Carnival Panorama. In fact, the team behind the breweries on those ships are also involved in bringing the new beers to guests across the fleet. The announcement was made onboard Carnival Magic when the ship was docked at PortMiami, Florida. The beers can be purchased at the bars in can form or on tap. Guests can even take home their own four pack to remind them of the cruise. It was also revealed that when Carnival Panorama joins the fleet and debuts from California in December 2019 unique brews are being developed including Miami Guava Wheat and Pumpkin Spice Ale. Almost 300,000 pints of Carnival private labels have been served to guests since the first brewery at sea in North Americ was introduced on Carnival Vista in 2016.